Vegan Runner Eats » Breakfast » Week 8 of Marathon Training. Classic Steel-Cut Oatmeal with Blueberries – the Most Comforting Breakfast! Uh oh – time is going by so fast! Can’t believe I’m writing a report about week 8 of my marathon preparation. Another eight weeks, and my race will be here! I know, I know – I might sound kind of stressed saying this, but actually I’m kind of excited! Yes, setting any big goal (including running a decent marathon on a vegan diet) will bring plenty of stress and excitement, but it’s important to stay focused and celebrate every milestone while on the way to that bigger goal. And whenever we go through a confidence-building experience, let’s celebrate it even more! 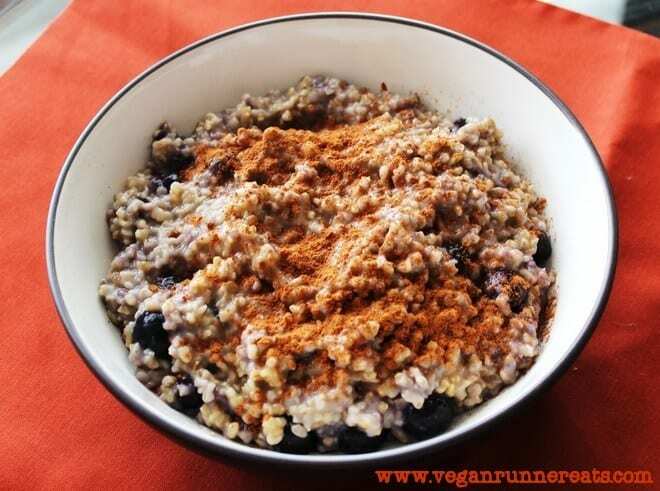 Steel-cut oatmeal with blueberries, cinnamon, and ground flax seed – healthy carbs coming your way! I was able to recover much better after this long run than last year, and I’m sure this has A LOT to do with my plant-based diet! All those antioxidants did a great job tackling on inflammation and oxidative stress of my 3-hour-long sidewalk pounding, and my Swamp Monster Smoothie was a great post-run start to that process! Today’s the rest day for this gal! And how could I relax better than by eating lots of plant-strong foods loaded with complex carbs and fiber? 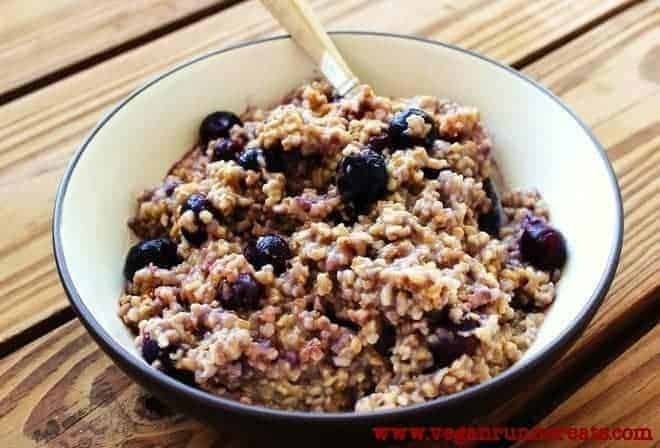 By starting off with a simple and delicious breakfast like this steel-cut oatmeal loaded with blueberries! The beauty of this recipe: besides tasting delicious and being easy to make, this oatmeal is very hearty and filling! Trust me: my metabolism is so fast that I get hungry half an hour after eating any type of carb-heavy breakfast, but after a bowl of this oatmeal, my stomach is full and happy all the way until lunch! Steel-cut oats (also known as Irish oats) are the least processed among all types of oats available in grocery stores. To make them, toasted oat grains are simply chopped into chunks the size of a sesame seed. Steel-cut oats are rich in fiber, B vitamins, protein, unsaturated fat, and calcium. They have a nuttier, more chewy texture than rolled oats, and because all of the fiber remains intact during processing, they fill us up better than the more processed types of cereals. Sprinkle some cinnamon on your bowl of oatmeal for extra nutrition! Blueberries are loaded with antioxidants! I like adding a handful or two of frozen blueberries to the pot of this oatmeal as soon as I take it off the heat; this way the berries get instantly defrosted by the heat of the cooked oatmeal, but don’t get overcooked, and the oatmeal cools off a bit, so I’m not going to burn my mouth eating it right away. 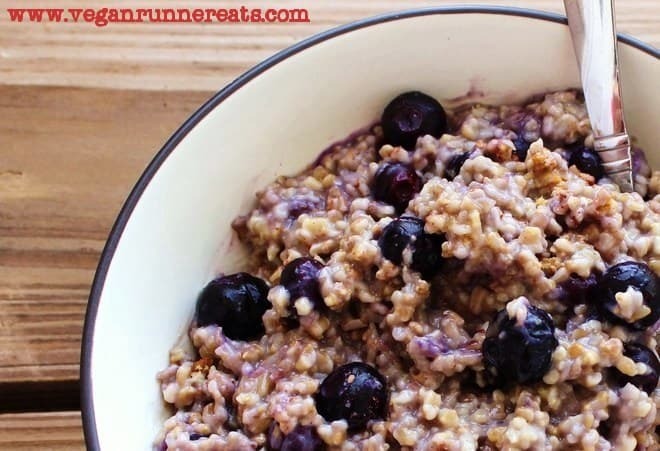 You’ll love how each blueberry bursts in your mouth when you’re chewing this oatmeal! You can also use fresh blueberries if they are in season, or add any other berries or fruit to your oatmeal as you please. I suggest adding some ground flaxseed and cinnamon to your bowl to make your breakfast even more nutritionally rich (here’s my post on health benefits of ground flax and other vegan essentials). As with other fiber-rich foods, it’s best to eat them after strenuous physical activity, not before, to avoid gastrointestinal trouble. This delicious and easy-to-make oatmeal is a nutritious start to a good day! To make it even healthier, use organic wild blueberries. Combine almond milk and water in a tall heavy-bottomed saucepan. Bring to a boil; be careful as the liquid can overflow as soon as it starts boiling! Once the liquid is boiling, add oats. Reduce heat to medium-low, cook uncovered for 10-15 min, stirring often to prevent the oatmeal from burning to the bottom of the pot. Add more water if it starts looking too thick. The oatmeal is ready when each grain becomes soft and not too chewy as you taste it. Just before taking the oatmeal off the heat, add brown sugar/maple syrup. Stir well to let them dissolve. Take the pot off the heat. Immediately stir in frozen blueberries. Let stand 2-3 min before serving. To serve: ladle the oatmeal into each bowl, sprinkle with ground flaxseed and cinnamon. Stir them in and enjoy! I like using steel-cut oats for this recipe; however, you can substitute them with old-fashioned rolled oats and reduce cooking time to 8-10 min for equally delicious results. What’s your favorite plant-strong breakfast? Do you know any other recipe versions of vegan oatmeal? Share your thoughts! Tagged blueberries, cinnamon, marathon training, oatmeal, Pensacola Marathon 2013, vegan breakfast, whole food plant based diet. Bookmark the permalink. 4 Responses to Week 8 of Marathon Training. Classic Steel-Cut Oatmeal with Blueberries – the Most Comforting Breakfast! I soak my steel-cut oats overnight and put them in the microwave for a bit over 2 minutes the following morning. Easier cleanup! That’s an interested tip, Nadege, I should try this!